The Rib Room Bar & Restaurant in the Jumeirah Carlton Tower Hotel opened in the 1960s and soon became well known in Knightsbridge as ‘the’ place to go for its roast rib of Aberdeen Angus beef. Today The Rib Room remains a grand dame of an English restaurant. The voluminous dining room is filled with plush furnishings and is sumptuously decorated in a sea of green and amber. It’s the kind of place where, back in the day, you might have imagined customers dining in their dinner jackets. Head chef Ian Rudge worked with Nigel Haworth at the one Michelin starred Northcote Manor and the two Michelin starred Whatley Manor and he brings a touch of the modernity to The Rib Room with his Seasonal Menu. But it was for its Classic Menu that The Rib Room became well known, and this menu is still available to diners to this day. The Classic Menu is fairly pricey so the seasonal menu at two courses for £49 and three courses for £58 offers reasonable value. From the Classic Menu, half a dozen Loch Fyne Angel oysters (£15) were glorious with the oysters being fresh, creamy and extremely meaty. 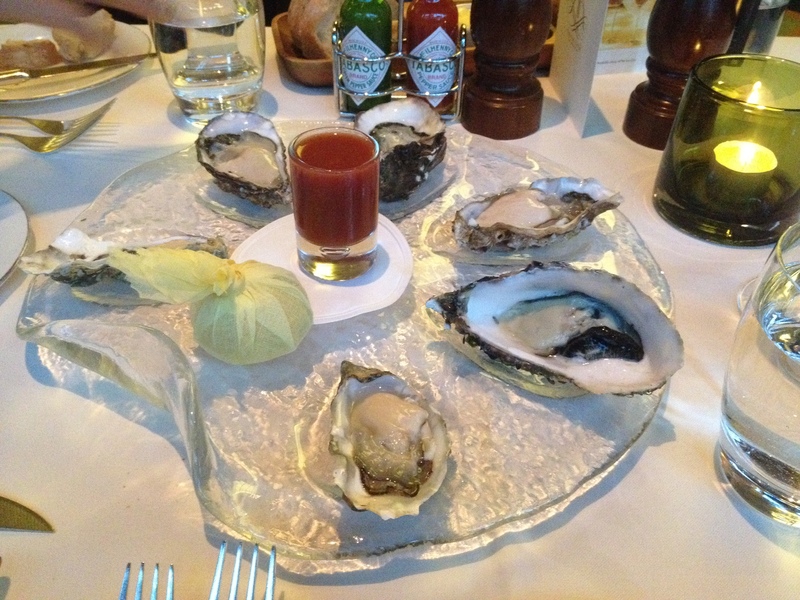 There was a shot of Bloody Mary to go with the oysters which was nicely done. With the gentlest hint of Worcestershire sauce, it livened up the flavour of the oysters wonderfully. We also asked for some vinaigrette which was excellent. The sweetness and acidity was really well judged to produce a vinaigrette that was one of the best that I’d ever tried. 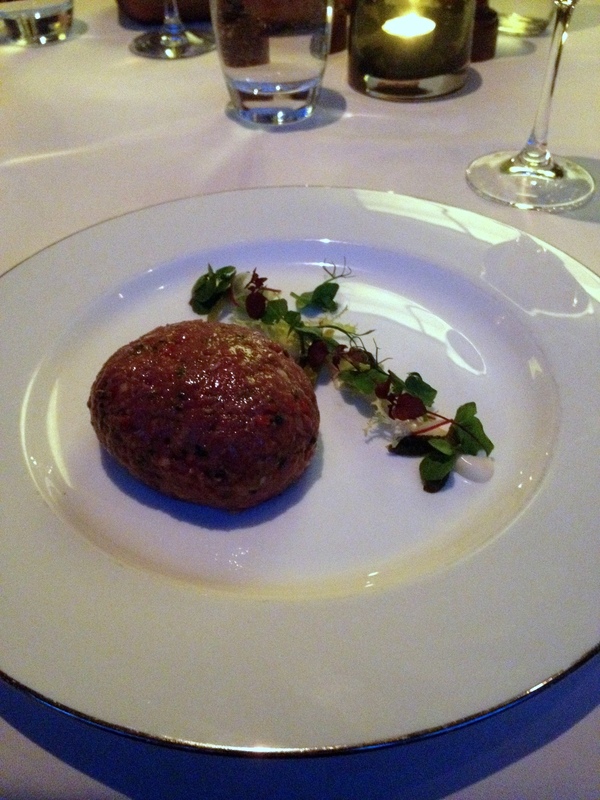 The Aberdeen Angus beef fillet used in a beef tartare (£17.50) was of a blindingly good quality and supremely flavoursome. Texturally it was also wonderful as it had been finely chop and was perfectly smooth. The tartare comes to the table first with condiments of capers, chives, garlic, gherkins, chilli and shallots. You then specify the level of spiciness that you want after which the waiter takes the tartare away to mix. We asked for mild and found this to give the tartare quick an lively kick. 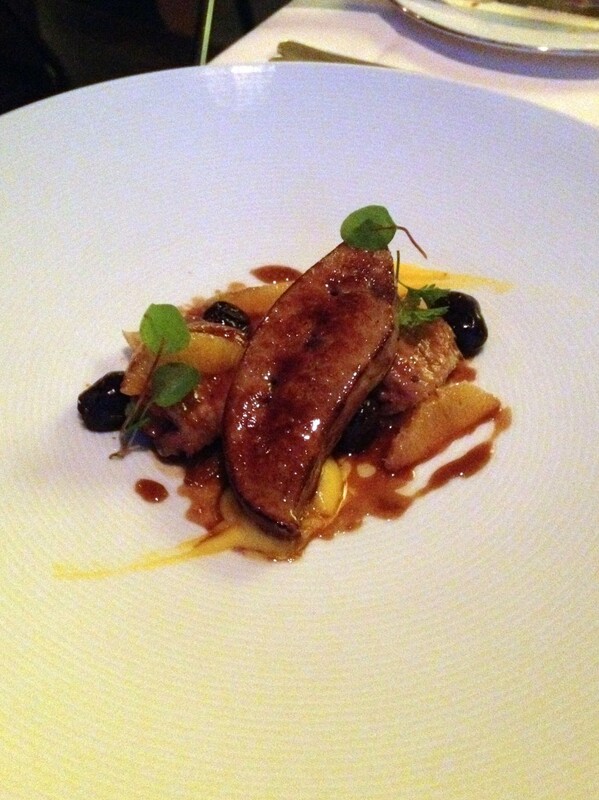 Pan seared foie gras (£18 from the seasonal menu) was delicious and came with some wonderfully moist and tasty glazed chicken wings. As accompaniment there were some raisins and crunchy baby chicory as well as an orange and sherry reduction. The sauce was well made, however a little more sweetness in the sauce would have worked better with the foie gras. The signature dish of roast rib of Aberdeen Angus beef (£44) wowed with its quality. The beef comes from Donald Russell who became a Royal Warrant Holder in 1984 and is a trusted supplier to H.M. The Queen. 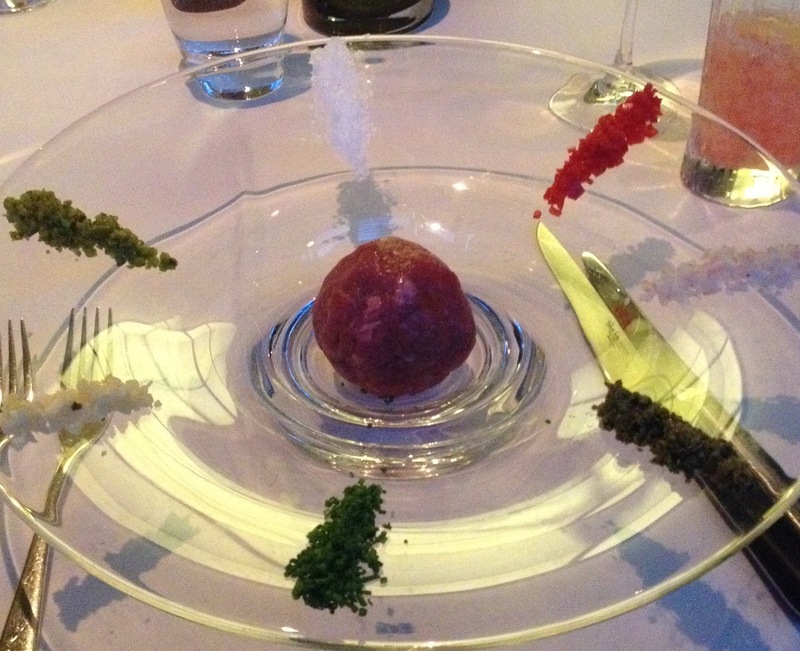 It was easy to see why this beef received such an accolade as it was very tasty and fabulously tender. Gravy was poured at the table and this was also excellent as this had been smoothly reduced and complemented the sweet flavour of the beef nicely. Only the Yorkshire pudding disappointed as it was a bit burnt. Wagyu rib eye (180g – £70) didn’t live up to expectations as it didn’t deliver the intensity of flavour that one might have thought would have been forthcoming from such a premium grade of steak. It had also been quite thinly cut, so it didn’t produce the same wonderful texture that thick cuts of beef usually have. Nor did the wagyu have the rich marbling that we were looking forward to. 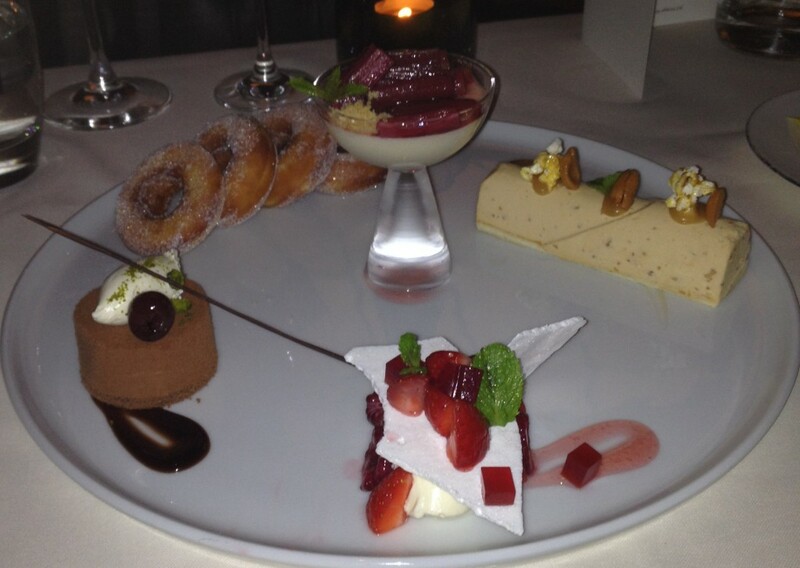 The dessert taster for two (£22) was accomplished and showed off some classic skills. There was an Eton Mess that came with a delicious cream and a lemon cream that was zingy and sweet and topped with some rhubarb that was soft and not too sharp. The peanut parfait was wonderful with its dense creaminess and nutty peanut flavour. And the chocolate delice was light and airy and bursting with a rich chocolate flavour tempered by the use of a thin sponge layer at the bottom. There were also some donuts which were decent but perhaps could have been lighter and fluffier. Overlooking the wagyu, the cooking was otherwise of a stellar quality. But what was particularly memorable was the service that was nothing short of courteous and professional. It was what you would expect of a restaurant in a 5-star hotel in Knightsbridge. Prices can be high if you’re ordering from the Classical Menu, but The Rib Room offers a grand classical experience. £53 to £90 for three courses from the Classical Menu. Two courses for £49 and three courses for £58 from the Seasonal Menu.